Grand National 2015: Where will the headlines be written? 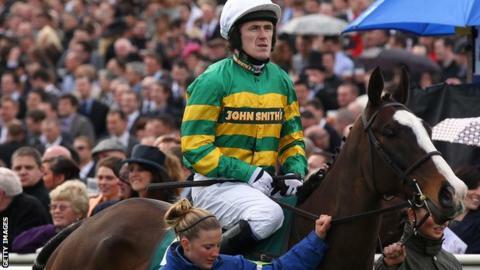 All eyes will be on AP McCoy as Aintree's three-day Grand National meeting starts on Thursday and leads up to Saturday's big race at 16:15 BST. But there are plenty of other talking points for the 150,000 racegoers and 500 million people tuning into the world's most famous steeplechase. We take a look at where the potential headlines will be written. What mixed feelings will be experienced by AP McCoy as he walks over Aintree's threshold to compete in a record-breaking 20th Grand National, this time on Shutthefrontdoor. The soon-to-retire champion jockey, winner of the 2010 race on Don't Push It, has indicated that a second success on 11 April would see him shut the door, there and then, on his peerless career. Otherwise, the 40-year-old is expected to call it a day when formally winning a 20th successive title at the jump-racing season's Sandown finale a fortnight later. However, the historic possibilities at Aintree will ensure that Grand National day's already palpable sense of anticipation will be more intense than ever. Bookies believe McCoy's mount, owned by businessman JP McManus and trained by Jonjo O'Neill, could gallop to the first of the 30 jumps as the shortest-priced favourite since Red Rum went off at 7-2 - and was beaten into second place - in 1975. Shutthefrontdoor, winner of Ireland's Grand National in 2014, has been confined to only one outing since - a successful one at Carlisle in November - but is reported by O'Neill to be raring to go. A final victory in the world's most famous steeplechase would be a fitting conclusion for McCoy, but it's worth recalling that a decent dollop of good fortune is required in the Aintree feature whose first winner - in 1839 - was named Lottery. And luck has been known to desert him here: it took 15 attempts before he won the National, and of his other 18 mounts in the race, only seven completed the famous course. Such is the support for McCoy that bookmakers are predicting as many as one in three of the £150m worth of bets placed on the Grand National will be supporting Shutthefrontdoor. Most years the race, for which betting volume is the equivalent of the whole of the four-day National Hunt Festival at Cheltenham, has the bookies licking their lips as the gambles mount up. This year, however, is described simply as a "one-horse agenda". It's estimated that after all the sums are done, a McCoy win would cost the UK betting industry a profits-affecting figure of about £30m. No-one would begrudge a victory for Richard Johnson, runner-up behind the champion 15 times, and due to ride last year's second Balthazar King in what is the jockey's 19th consecutive Grand National. Johnson, 37, and, with nearly 2,800 winners by far the second most prolific jump jockey in history, has joked that beating his old rival by a short head would be a "perfect" result. Balthazar King, trained by Philip Hobbs, was 15th in 2013, and has been trained specifically for the race, meaning he missed the chance to defend his Cross Country title at the Cheltenham Festival to "keep him fresh". A Grand National success for McCoy would be big news, but were Nina Carberry to win on First Lieutenant, the volume of headlines she would make as the first woman jockey to win would be barely a photo-finish distance behind. And though First Lieutenant, trained in Ireland by 'Mouse' Morris, is rated a 33-1 shot, the horse's form over the years looks strong enough to give him more, dare I say, than just a squeak. Carberry has ridden in the race on four occasions - finishing seventh on Character Building behind Neptune Collonges in 2012 - and the 30-year-old certainly has the pedigree for it. Her father Tommy Carberry has both ridden and trained a Grand National winner, having partnered L'Escargot - trained by his wife's father Dan Moore - to victory in 1975, and then saddled the 1999 winner Bobbyjo, ridden by his son, Nina's brother, Paul. A total of 15 female riders have lined up in the race, with Carberry's sister-in-law Katie Walsh the highest-placed finisher when third on Seabass behind Neptune Collonges in 2012. Walsh, sister of champion jockey Ruby and winner of Monday's Irish Grand National, has told BBC Sport she believes a female jockey will soon win. What's turned out to be a prolific jumps season for teenaged jockey Sean Bowen has already seen him tipped for the top by a string of acclaimed pundits. Now the sport's leading conditional (apprentice) rider is all set to make his Grand National debut on Mon Parrain - just. It was only last weekend that the 17-year-old, whose trainer-father Peter saddles Al Co, landed his all-important 10th steeplechase win - part of a treble at Haydock - the number required to gain eligibility. Success on Mon Parrain, trained like fellow big-race hopefuls Rocky Creek (last year's fifth), Unioniste and Rebel Rebellion by Paul Nicholls, Bowen's boss, would make the fledgling jockey the youngest to win in 77 years. In 1938, Bruce Hobbs was also 17 when taking the prize on Battleship, though Hobbs would remain the youngest ever being nearly four months Bowen's junior at the time of his victory. Talking of age, evergreen equine OAP Oscar Time - previously second and fourth - is 14, and would be the oldest victor since 15-year-old Peter Simple (1853). Amateur Sam Waley Cohen will be on board. The split over the Grand National in a house near Shakespeare's Stratford-upon-Avon may not be of the magnitude of the Capulets and Montagues in Romeo and Juliet, but still rivalries are fierce. While jockey Chris Ward, daily work rider of the 2014 winner Pineau De Re is full of confidence about his pride and joy, his partner Amanda Pettitt believes her gallops-mount Royale Knight can cause an Aintree upset. The couple are both employed by GP-turned-racehorse-trainer Dr Richard Newland who's himself convinced that despite an indifferent run of form Pineau De Re could be the first dual winner since Red Rum in the 1970s. And he insists Royale Knight should not be entirely discounted. "Amanda has nicknamed her horse 'Number One', said Ward, 24, "but 'Pineau' feels massively like he's coming good again; everything he's doing at home indicates he's at the top of his game. "In the yard, there's a 'Pineau' camp and a Royale Knight camp, though most of us are dreaming of a dead-heat." Of last year's winner, he added: "He's a handful on the gallops, very keen, like his tail's on fire, and would run away with you if you let him. But he's very well, and I can't wait." Ward and Pettitt, 26, missed the race last year after the flights for a skiing holiday were delayed so they were in the air while it all took place, but this time they'll both be on Merseyside to be part of the Aintree drama. It's not just on the political stump that they talk of the North/South divide. More than ever, members of British jump racing's northern circuit look on in beleaguered fashion as their southern cousins dominate, a situation underlined at the Cheltenham Festival where nothing more than two fourth place prizes went to the North. Simple economics are blamed - "the money to buy good horses isn't up here" is a regular refrain - so what a fillip a big run from a 'local' at the region's major national hunt fixture would provide. The hopefuls, headed by Night In Milan, trained near Saltburn-on-Sea, Cleveland by Keith Reveley, and ridden by his son James, are all varying degrees of outsider, but then so was the last northern winner Auroras Encore, a 66-1 shot in 2013. Reveley junior, 26, who's also enjoyed lucrative spells riding in France, said: "He's in great order, exactly where we want him. He schooled over the Grand National-style fences at Malton last year [when narrowly missing out on a run] and showed good technique. "He's done well at Doncaster, which is a flat track where the emphasis is on jumping, like Aintree. I just hope I get a bit of better luck for him - I've not got round in three rides." The Grand National once again takes place over a course that was the subject of £1.5m of modifications following the deaths of two horses in 2011 and again in 2012. Officials believe the changes, which included making the 'core' of the obstacles plastic rather than wooden, plus alterations to the landing sides and to the race start, ensure a fair balance between safety and the obvious risks for all participants. In the last two years, there have been no fatalities in the race (though two in other races staged over the big fences), and the number of fallers is down; most horses that don't complete the course unseat their riders or are pulled up. The biggest controversy of 12 months ago revolved around yet another false start, consequently alterations to procedures have been made so runners assemble well behind the start before being called forward. • With the month-long gap between the jump racing festivals at Cheltenham and Aintree being wider than sometimes, more Cheltenham stars than ever are expected to line up in the supporting races. During the three days, a total of 10 Grade One races will take place, with the contenders chasing £2.75m in prize money, £1m in the Crabbies Grand National itself. • Certain runners in the big-race are said by the official handicapping team to be 'well in', in other words had their weights been allotted now rather than mid-February, they'd have been greater because of recent form. Falling into this category are Cheltenham Festival winner The Druids Nephew (10 pounds higher) Rocky Creek (9lb), Rubi Light and Soll (7lb). • From the 2014 running, Pineau De Re heads the return of six of the first seven home. They include fourth-placed Alvardo, again the mount of jockey Paul Moloney who has an outstanding National record, with form figures of fourth, second, fourth, fourth, third and fourth in the last six seasons. • Were either Lord Windermere or Spring Heeled to be successful, their ex-jockey-trainer Jim Culloty would become only the sixth person to saddle as well as ride the winner after his success aboard Bindaree in 2002. Read more on Grand National 2015: Where did your horse finish?